so i'm finally doing it...creating my own food blog. whether anyone REALLY wants to read about what i eat and my thoughts on it...we shall see. but here we go! just a little background on myself and why i'm doing this. i like to think that i have a very discerning palette when it comes to food. i attended culinary school, the california culinary academy in san francisco to be exact, back in 1996. it is there that i developed an even more acute awareness of a variety of flavors and cuisines which i am so thankful for! why else am i qualified? well...besides the fact that i am IN LOVE WITH FOOD...i guess you can you'll just have to read and try the different places i go to and see for yourself. i am really picky about things and will always be very forthright and honest in my assessment of the places i go to. i love anything from mom and pop places to high end restaurants...i am not a food snob in the sense that i won't try anything that isn't from a fancy restaurant or is a bit on the strange side...(honestly, i don't like eyeballs and scrotum sacks like andrew zimmern) but i'm down to try new things. if anyone who does read this and has suggestions for new places please let me know. i get on certain food kicks...for example, korean bbq, i will keep trying new places till i find THE best place, in my opinion. so feel free to write me. i have a.d.d. so if i jump around a lot...sorry. haha i just write what i think...and believe me...i'm no writer...i'm an eater! over time, i will try to video the different restaurants i go to so you get a better sense of the food and my reactions to what i'm eating, but until then...it will just have to be still shots of the food. i finally had a chance to eat a banh mi sandwich from Lee's sandwiches, i got the #11 special with the jambon, headcheese and pate...to all you lovers of Lee's...i have to say, it was alright. 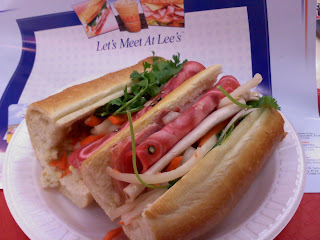 the pickled veggies were tasty, but kind of big and i felt like i didn't have enough inside the sandwich. the bread was great, but a bit on the dry side...i needed some mayo to give me that creamy texture so needed when eating a sandwich. i wished that there was actually more pate inside to help give me a bit more creaminess and flavor, but it was sliced so thin i could barely taste it. i had a lot of crunchy textures going on with the headcheese which reminded me more of thinly sliced pig ears, like i had in philly. overall, let me just say, i was not blown away by this sandwich by any means and was a bit disappointed after hearing how great it was. after posting my comments, i had a couple more recommendations on other bahn mi sandwich shops...zon baguettes and mr. baguettes. lucky for me, my dad went to mr. baguettes and picked up another "special" sandwich...which i finally ate today. granted the sandwich was a day old, but it was soooooo much better than lee's. i could TASTE the creamy pate and i really got the flavor and essence of pate in this sandwich...on top of which they had mayo in it!! THANK YOU! the pickled veggies were shredded and i was able to put them throughout the entire sandwich which made such a huge difference! everything to me is about balance...having the right amount of each element so that when i take a bite, i get a little bit of everything...creating the perfect flavor combination in my mouth! i LOVE that!! that's what i look for in everything i eat. thanks to all my friends who have given me the idea to do this...i really appreciate all of the support!! have a great day to all of you and eat something delicious for me! i enjoyed reading your first review mainly because i found your comments to be detailed and specific. in other words, you discussed every aspect of the sandwich, from the texture of the bread, the pate, the mayo, and the lettuce. the best part of your review is that it is straightforward and easy to read. thank you for your comment! i really appreciate it! i like the feed back and will try to keep it that way. thanks for your feedback on Zon Baguette. i am going to try the special combo, again, so that the comparison is all based on the same exact sandwich. lol...you are so funny, i wasn't very excited about the tofu when i read that...but i'm not a big tofu freak. did you like the bread? thank you karen, its so interesting to write about it...i really like the feed back...so thank you. hope you like the reviews! Auntie Doreen....love the site & will visit it often to see where mommy and me can eat!! THANKS!! awww...thank you so much ty!! you are so welcome! i can't wait to hang out with you and mommie again!